Auslogics Disk Defrag is a free tool which can be used to speed up your PC's hard disk drive(s) by rearranging files from a fragmented state to a better organized state where frequently accessed files and closer to each other. The interface of Auslogics Disk Defrag couldn't be easier to use and it's completely straight forward. To get started defragging your drive, simply choose the hard drive you want to defrag from the drop-down list and Auslogics Disk Defrag will quickly display the size along with current free and used space including a pretty pie graph. 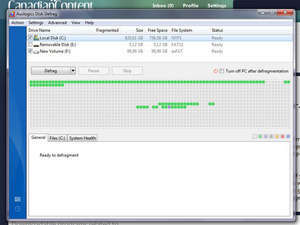 From there, click away and start defragging you drive OR analyze it first to see whether it even needs to be defragged. Version 8.0.23 is a freeware program which does not have restrictions and it's free so it doesn't cost anything. For security reasons, you should also check out the Auslogics Disk Defrag download at LO4D.com which includes virus and malware tests. Additional screenshots of this application download may be available, too. Auslogics Disk Defrag has a presence on social networks. Auslogics Disk Defrag download been highly rated by our users.